You know, I could get quite used to this winning malarkey. After struggling over the first month of the season to add to that opening day win at Garforth, Mossley made it three – yes, three! THREE! - in a row with a hard fought (rather too literally at times) victory over Trafford at Seel Park. The opening period was a keenly contested affair during which Mossley controlled the majority of possession but couldn't find a finish to match some excellent approach play. Trafford on the other hand looked happy to soak up the pressure and try and use the pace of their wide men to hit their opponents on the break. The breakthrough finally came a minute before the half hour when Steve Moore's angled run towards goal was brought to a halt by Trafford defender Billy McCartney. Despite winning the ball cleanly the referee deemed the challenge from the former Mossley player an illegal one, the result of which was a penalty that Danny Egan calmly converted to give the home side the lead. One quickly became two after Moore unexpectedly found the ball at his feet courtesy of a terrible clearance by Trafford keeper Tom Read. Taking a couple of touches to bring the gift fully under control and create space for the shot, he stroked the ball past Read to register his first goal in a Mossley shirt. And not only that but their first goal in open (non set-piece) play since Michael Jackson was still warm. It was at this point though a game which had been played in a '(very) hard but (mostly) fair' spirit suddenly boiled over into something a bit more unpleasant. Somewhat understandably the visitors began to get a bit frustrated at going two goals down but the way it manifested itself in some of their players was not for the faint hearted. Challenges became wild and reckless and that they managed to make it to the interval with eleven men on the pitch raised more than a few eyebrows. Melford Knight in particular endeared himself to the supporters of the club he used to play for with a display you wouldn't normally associate with a team captain. After spending what seemed like a good three minutes arguing with the referee about an incredibly trivial incident as the game went on around them, he was fortunate to receive only a yellow card and not a straight red for an awful tackle. There should have been less yellow and a touch more red in this picture. He wasn't alone though and as the teams trooped from the pitch at the interval it was hard not to wonder how long it would be before a player was forced to make that walk alone under the very specific orders of the referee. Ten minutes as it turned out. That's the length of time that passed between the match restarting and Trafford's Shelton Payne being given the opportunity get off home a bit earlier than expected; a yellow card for a completely unnecessary tackle from behind next to a corner flag, immediately followed by similarly hued one for dissent. Bizarrely the dismissal seemed to have a calming effect on the visitors and the rash tackles were replaced by some good passing football. And despite the disadvantage in numbers they actually looked for a lengthy period of time like the side most likely to score next. That they didn't was down to a combination of two things: some excellent defending from the Lilywhites and the same awkwardness in front of goal that Mossley themselves have displayed on numerous occasions this season. As they began to throw more men forward in search of a way back into the game, gaps started to appear for Mossley to exploit and but for the width of a post and an offside flag the margin of victory would have been a lot more comprehensive. Not that many associated with Mossley will complain though as the 2-0 score line gives them their first home league win of the campaign and brought to an end a week which has seen a sharp and welcome upturn in their fortunes. Three consecutive wins. Three consecutive clean sheets. Three consecutive sentences with the word consecutive in it. Who'd have thought after the Salford game that such things would transpire over the course following eleven days? If you answered “I did!” to that last question then I would like to take this opportunity to point out your pants are on fire and that your nose is longer than a telephone wire. But that's football isn't it? It's not a game designed for people who are allergic to surprises or who hate having their sanity slowly chipped away at. It's there for us masochists to get whatever pleasure we can out of the extreme highs and lows it puts us through before it finally sees us off. I'm sorry, I think I must have fainted there with the shock of it all. Goodness knows what state I would have been in had I been at Station View to witness it happen live. And that last sentence should be a big clue as to why this posting on the blog contains no report on Mossley's trip to North Yorkshire. If you wish to read about what took place on Harrogate's sloping pitch on the afternoon of September the 27th 2009, then I suggest you click on the following link to read the official Lilywhites match report. If, however, you just want the basic facts: Mossley won with three second half goals from Karl Brown, a Railway defender and Matty Kay. There was a couple of bookings, a bit of shouting and one or two people probably swore. Hold on to your hats everyone - we won! Yes, after ten unsuccessful attempts to outscore their opponents since the opening day of the season at Garforth, the smell of a Mossley victory fills the air once more. And not only was it a welcome result, it was a thoroughly merited one too; even if the team did leave it to the last possible moment to claim it. It took nearly two hours of football on the night for it to happen but Matty Kay's goal in the final minute of extra-time (his fifth of the season) was enough to separate Mossley and Radcliffe in a closely fought Unibond League Cup encounter at Seel Park. Actually closely is probably the wrong word to use. While it's true that the result balanced precariously on a knife edge until those final few seconds, as most 0-0 games tend to do, the declaration of the home side as victors should have come a lot sooner. Like I said not two paragraphs ago, it was a win that was more than deserved but Mossley being Mossley we didn't half make hard work of it. For the first time this season, at least in the games I've seen anyway, the Lilywhites were creating an awful lot of chances with a significant proportion of them being good ones too. Unfortunately (didn't you just know that was going to be the first word of the next sentence) the finishing touches weren't quite up to the same level as some of the moves they were stemming from. In fact, despite the number of “oohs” and “aahs” that were coming from the home support as another attack ended up resulting in a goal kick, Borough keeper Lloyd Rigby wasn't having a lot to do other than observe a succession of chances fly narrowly wide of the goal frame he was protecting or, as in the case of a diving header from Matty Kay towards the end of the first half, crash against it. He was finally called on to make a save, and a good one at that, just after the interval when Danny Egan broke clear of the visitors back line but it was a rare effort on target. All this isn't to say that the visitors didn't have any chances of their own – they did, more than a couple in fact; just not as many as their hosts and with an even lesser degree of accuracy. Mossley continued to look the side 'most likely' when the game moved into extra-time. There was a wobble when Egan talked himself into being shown a straight card, but it was brief and ten man Mossley continued to hold the upper hand. That winning goal though was still proving elusive. However, with a penalty shoot-out looming large (which given the standard of finishing on the night was a frightening prospect for those supporters who wanted to see the game concluded before sunrise) the final act of the game took place. It began with the number of players on the pitch being reduced by one more - Borough centre half Sean Connor receiving a second yellow card for a late tackle on Sam Walker. The free kick resulting from the incident was headed behind for a corner which Karl Brown swung into the box as the match entered its 119th minute. Out of the herd of players crowded in the box, Matty Kay rose the highest and planted a header powerfully past substitute keeper Joe Brobbin - sparking the kind of celebrations you don't normally expect to see in the first round of the Unibond League Cup. All told this was the kind of performance that we haven't seen (and been crying out for) from the Lilywhites since the pre-season friendlies. There was a visible drive and determination amongst all the players, rather than appearing to be confined to just the odd few, and this may just be an amazing coincidence but this, our best display of the campaign so far, came during a game in which the ball spent more time on the grass than pinging through the air. It wasn't perfect (a fair bit of finishing left a lot to be desired and the occasional yawning gap at the back went thankfully unexploited) but when a last minute goal wins you the game two hours after it started it's surprising how much you're willing to forgive. It may not have been a classic but we played well and we won. And after the start we've had I'm more than happy with that. Having forgotten to pick up my just charged camera battery as I left the house to come to the game, I had to make an incredibly inferior third party one last a couple of hours which meant that I missed most of the chances that took place. By a stroke of luck though I decided to use what little power was left in it to film the last corner of the match as I knew it wouldn't make it through the impending penalty shoot-out. And as a consequence I have captured Mossley's late winner for posterity. However, because the league have dictated that video footage of matches can only be placed on the internet via their official web partners, and not sites like YouTube in case the reputation of the Unibond League or their sponsors gets damaged (it's certainly nothing to do with money - no siree and shame on you for thing such a thing), I can't show you it. Rather than proper video footage I can bring you the goal in the form of an animated gif. The quality is nowhere close to being as good as that of a regular video clip but it's the only way I can put it on the blog. There's no sound either but there's a way round that too. So if you want to hear what happened as well, press play on the audio bar beneath the animation when Karl Brown places the ball down on the ground for the corner. I admit it's not as good as watching a proper video of the incident but until the league change their ridiculous and self-defeating ruling regarding them, this Heath-Robinson approach is the best I can do I'm afraid. It would be remiss of me before I finish this report not to wish Ben Richardson a speedy recovery after being stretchered off in the first 'second half' of the game. I've no doubt every one at the ground who witnessed the challenge will have an opinion on it but to me his injury was the result of a clumsy tackle rather than anything malicious. One of those incidents where ninety nine times out of a hundred nothing would have happened. Anyway, get well soon. There's a popular saying that states lightning never strikes the same place twice. Unlike most adages though which are built on a modicum of truth, the wisdom this particular one contains is nothing but a myth. Scientists have spent hundreds, thousands and, likely, millions of pounds proving it to be false, yet they could have got the same result for the measly outlay of £14 - that's all it would have cost them to watch Mossley's last two home league games with Salford. For the second year in succession The Ammies arrived at Seel Park still searching for their first win of the season and for the second successive year they left with it. The only difference this time being that they they claimed their points of the campaign too and all they needed was a solitary goal. Its arrival eighteen minutes into the match was the result of a rare moment of quality on what was otherwise a poor afternoon for good football. A slide rule pass sent Adam Morning scampering away down the left wing and after beating Andy Watson not once but twice, the former Mossley winger fired over a cross which was met at full stretch by the head of another ex-Lilywhite, Rhodri Giggs, who directed the ball beyond the reach of Peter Collinge. A few minutes later a shot by Danny Egan forced Andy Robertson into palming the ball over his crossbar, but other than a couple of half chances that flashed across the face of goal, that was best opportunity Mossley could muster in response to going behind during the opening period. In fact the Lilywhites were fortunate they weren't facing an even bigger deficit to overcome at the start of the second half after Carl Ruffer grazed the post with an unmarked header from close range just before the interval. From a Mossley perspective what followed after the break was marginally better than what had preceded it but it still fell some distance short of being enough to rescue the game. Eight minutes into it Egan once again tested Robertson, this time with a shot from distance that the keeper fumbled, rather than pushed, away for a corner. Over the remainder of the match though Mossley were only able to carve out one more real opening and it came with quarter of an hour left. Substitute Rob Crank played the ball into the path wing back Ben Richardson and his cross fizzed along the edge of the six yard box to Egan. The forward though, probably not realising just how much time and space he had, swung wildly at the ball and spooned his shot high over the cross bar. The visitors had the chance to seal the points during a goalmouth scramble in which three shots were blocked in quick succession but a second goal proved unnecessary as Mossley continued to flail, much as they've done all season, in the attacking third of the pitch. The closing stages playing out with the same lack of urgency that had characterised most of their play on the afternoon. The final whistle was the cue for scenes of celebration from the visiting contingent while those with Mossley's fortunes at heart were left to ponder on another poor week for their side; one in which an early season blip is beginning to resemble a crisis. To bring this report full circle I'm going to mention another adage that seems pertinent for this particular report and, unlike the lightning one, does contain a lot of truth: if you can't think of anything nice to say, then you shouldn't say anything at all. And now the closing paragraphs. With a little over a month of the season gone is it too early to start panicking? Possibly. But with just one win and five goals scored in nine games, almost thirty players used and now successive defeats to what were the two worst teams in the division form wise, it's hard not to worry about what the next seven months could have in store. What? You want to more than that? Well if you do then, my, have you come to the wrong place! Instead of freezing my feet off at Dimple Wells, watching Mossley's most recent efforts to put further distance between themselves and the top of the table, I was at home; my dad's birthday taking precedence over matters football. Although that said, I very much doubt I'd have been there if such an occasion hadn't coincided with the game. Therefore with not having seen the match, I can't give you any indication as to whether it was a noble defeat or the latest in the ever growing line of miserable displays and results. However, that's not to say that I don't have an opinion on it, I'm just not putting it on here. Yet. It was a game of little incident in which Mossley failed to break down a poor Osset side. And given that we've also failed to break down poor Cammell Laird and Warrington sides this season, I think the p-word is an adjective that can also be applied to us. Thanks to their 'one dimensional' game plan though Ossett tooke the lead with twenty minutes remaining and added a second not long after, leaving Mossley with a hill too steep to climb in order to rescue the game; a situation not helped by the only forward in the sixteen man squad having long since been substituted. So the spiral continues and sadly at the moment not in an upwards direction. Instead we appear to be riding a nutty log round the toilet bowl of the Unibond First Division North and heading for NWCFL sewage system. If we can't improve then our only hope is for some of the stools we're jostling with block up the u-bend before we get there. And given that these sides are currently beating us, it's not a hope that can be considered great. Oh well, if we can't claim three points off the second worst side in the league, lets hope we can beat the worst on Saturday when Salford turn up at Seel Park. Or at the very least hang on for the draw. The search for the first win since their opening day victory over Garforth continues for Mossley after they were held to one-all draw at Seel Park by Leigh Genesis - a name which after over twelve months still resembles that of a pub singer rather than a football club. As someone accurately pointed at half-time, it was easy to see why both sides were playing a league game and not an FA Cup tie like most of their peers were. I’m not saying it was bad... okay, maybe I am a little. After a relatively even (a polite way of saying not a lot happened) forty five minutes of football that certainly felt much longer, one goal was all that separated the two sides. And thankfully it was a goal that went Mossley’s way just after the half way mark. In the chase for the ball across the edge of his own penalty area, Genesis captain and former Lilywhite centre half Jonathan Smith ended a race he was losing by clumsily sending Matty Kay tumbling to the floor. Despite Smith's protestations of innocence (somehow managing to keep a straight face while arguing that he didn’t just perform one of the most obvious fouls this season) the referee had little option other than to punish him and after consulting with assistant as to where the offence took place, pointed to the penalty spot; Kay himself converting the kick for his fourth goal of the campaign. Sadly it was a lead that the Lilywhites could not hang on to, their propensity this season for conceding soft goals in the early stages of the second half coming to the fore once more. The player to benefit on this occasion was Andy Heald who took advantage of some static defending to loop a header over Peter Collinge and into the Mossley goal. For a significant stretch of time it appeared that this was going to be the final incident of note in a game that was slowly, and I do mean slowly, drifting towards its conclusion. With twenty minutes remaining however Mossley found a second wind that put their opponents on the back foot for the rest of the match. And though a winning goal never arrived it wasn't through a lack of effort. Matty Kay almost doubled his and Mossley's tally with a vicious shot from 25 yards that hammered back off the upright; Graham Kay volleyed wide from a position in which missing the target was the hardest thing he could have done; Stuart Wellstead finished a long, mazy run by tamely hitting the ball into the keepers arms and deep into stoppage time, substitute Steve Settle headed a corner wide the post. In the end it's a game Mossley will look back on and think they should have won. And after what has been a disappointing opening to the season, “should have won” is something of an improvement over what has gone before. With a bit more luck and composure in front of goal we might just have won. And but for that defensive lapse just after the interval it's likely that the penalty would have been enough to give the Lilywhites the win as well. To finish though (your eyes do not deceive you, this is a short report!) if you feel there's a lack of names above there's a very good reason for it – I’m not sure who was who and, sadly, I’m not just talking about the visitors here either. We may only be eight games into the season but Mossley have used nearly thirty players already, and keeping track of the comings and goings is dizzying. So don’t be surprised if in future reports you find Anon passing to Thingy, before Whosit skies the ball thirty yards over the top of the crossbar. To Ossett we head then (well you may be, I'm not) in the hope of stretching our unbeaten run to two games. Yes, the tension is indeed bearable. Who knew that apathy could have a positive side? My current state of ennui regarding Mossley, especially the away fixtures, meant that I turned down the chance to cheer them on/passively observe their latest outing at Warrington. And what a good decision it apparently turned out to be. The early messages filtering through about the game and the performance as Mossley went behind, and further behind, to goals from set pieces weren't good. Far, far from good in fact. But compared to some of the first hand accounts I've heard in the forty eight hours since the match took place, even those initial comments seem wishy-washy and non-committal on just how bad we actually were. There's a report on the game here (another one here too) and I'm just thankful that having heard what happened (or in Mossley's case didn't) I didn't have to write it; one thing I'm not particularly known for is my diplomacy after a bad performance. Actually that's not true as I can be pretty level-headed after one. It's when there's a string of them that I begin to lose the ability to write with tact and... well, we haven't exactly been ripping up trees or even weeds recently have we? So instead of standing in a strong wind at Cantilever Park, getting slowly depressed and not a touch angry at the display produced by a team I support, I was sat at home, unconcerned, watching old Trevor and Simon clips on YouTube and £7 richer than I would have been. Honestly, I could get addicted to indifference. Or alternatively you can download it by following the instructions here. There are no earth shattering revelations but hey, it's not that often we're on the radio (at least not when I'm able to record it) so it's there if you want to listen. Another day, another game and another report that could simply consist solely of 'hum' and 'ho' being arranged into a well known saying. It's hard not to imagine Mossley and Chorley having left Seel Park on Bank Holiday Monday with a mixture of conflicting emotions - both relief and disappointment at picking up a point in a game that either side could have easily won and lost. And the supporters likewise will have left in two minds; happiness at the the fact the game eventually provided some entertainment but sadness that the excitement came courtesy of a seemingly unending series of mistakes and not any great play. The first half was one short on chances, good football and entertainment but happily for Mossley, it was one which concluded with them holding the lead. The solitary goal that gave it to them came in the 23rd minute when Graham Kay looped a header into the net; an opportunity that presented itself following a short spell of pressure brought about by the visitors failure to clear their lines after a corner. Graham Kay heads Mossley into a first half lead. Such was the lack of anything else of note from either side (especially the Magpies) over the course of the opening forty five minutes, it seemed like that goal would be the defining incident of the day. Unfortunately it was a train of thought that didn’t take into account the generosity Mossley have been displaying towards opponents this season at Seel Park. In their previous two home games the Lilywhites have conceded goals almost immediately after the half-time interval and this match was no exception. In fact it proved to be worse as Chorley struck twice in the opening four minutes of the second period to edge them selves in front. Both goals stemmed from defensive errors with Terry Fearns punishing the home side for the first and Chris Amadi (by far and away the best player on the pitch) the second with a superb finish from the corner of the box. With Mossley offering little in the way of an attacking threat, it looked increasingly unlikely that they’d be able to arrest the run of home defeats. Thankfully though the rushes of blood weren’t solely confined to the Lilywhites back line as the visitors needlessly conceded a penalty eighteen minutes from time. Matty Kay successfully converting the spot kick for his third goal of the campaign. As the game balanced on the proverbial knife edge, both sides proceeded to squander chances in an error strewn final fifteen minutes to the game. 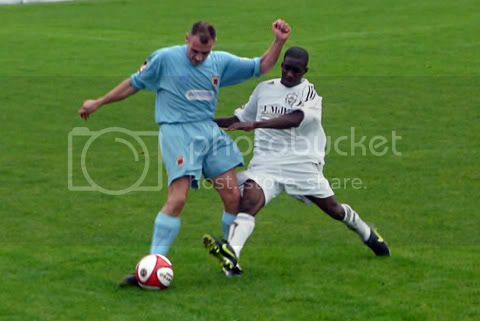 Mossley’s best opportunities fell to Matty Kay but twice he failed to connect properly with the ball as it bounced tantalisingly across the face of the goal. While at the other end of the pitch Fearns should have secured the win for Chorley in injury time but his shot after being put clean through on goal had a touch of cockiness about it. Instead of placing the ball firmly past the onrushing Peter Collinge, he tried to be oh so clever by chipping him with the outside of the boot and paid the price – the ball arcing away from goal and bouncing harmlessly wide. On the balance of play the draw was possibly the fairest result and given that either side could easily have lost in the closing stages, I suspect both will ultimately be happy with the point gained. As welcome a point it was too, it was though another Mossley performance that was lacking in certain areas. There was a fair amount of spirit shown but you can't win games on that alone. You need creativity, guile and solidity too and there wasn't much of that in evidence. Again. Much will be made of Mossley's threadbare squad on the day (we only had two subs to choose from) but the truth is that, the minor reshuffling aside, we played not much differently to how we've done when there was a full compliment to pick from. The forward line was still isolated to the point where at one stage in the second half, new striker Chris McCaughtrie was playing deeper than some of the midfielders in an attempt to get a touch of the ball. The defence continued to be their own worst enemy, while the midfield was like the staff in Curry's when you want to buy something - there one minute and gone the next. While leaving the ground after the match I overheard someone say that we should be beating sides like Chorley. Well if that was you then I hate to break this news: we are a side like Chorley, we're a mid-table Unibond First Division North team. Didn't you realise? And until some of the problems that have afflicted us in these early games have been rectified, that's where we'll remain for the foreseeable future. Unless of course we decide we want to keep some of the teams at the bottom of the league company. Ah well, it's still early days.